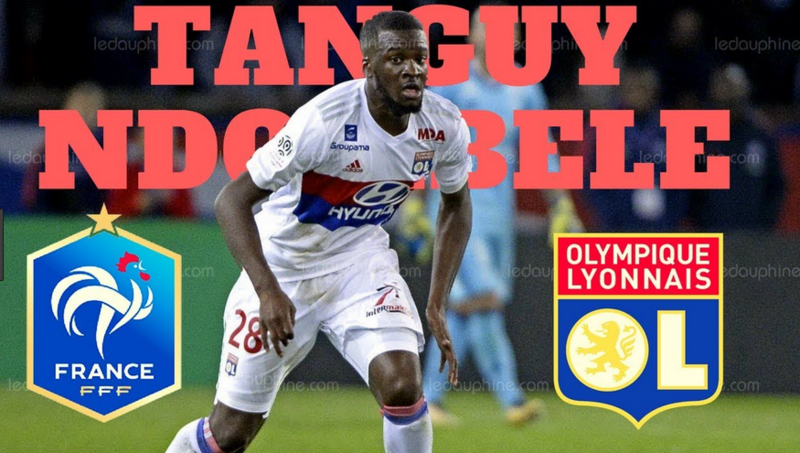 At the start of the 2017/18 season, very few people would have heard or noticed the currently-on-loan Amiens midfielder for Olympique Lyonnais, Tanguy Ndombele. However, after his incredible season so far, the majority of top clubs in Europe will surely be keeping a close eye on the 21-year-old who is dominating any midfield in Ligue 1. Starting 26 out of the possible 30 games in Ligue 1 so far for Lyon, Ndombele has operated in either a 4-2-3-1 or 4-3-3 formation set out by Lyon manager, Bruno Génésio. In the 4-2-3-1, he has played in a double pivot with the talented Lucas Tousart, who is more naturally defensive, where Ndombele’s first instinct is to carry and progress the ball. Tousart and Ndombele have developed a very effective partnership which has seen Lyon dominate the midfield battle numerous times, with both covering for each other whenever one decides to venture forward. In a 4-3-3, he plays as a modern-day box to box interior alongside Lucas Tousart and Houssem Aouar. Ndombele’s strengths; his dribbling, and his passing are best highlighted when he plays further up the pitch, as an interior in the 4-3-3. His natural ability to thrive in any position or formation his manager deploys him in highlights his versatility as a player. The ability to play under pressure whilst being calm and composed with full control of the ball is something any football player needs to master. This ability is something that Ndombele specializes in; his ability to manipulate the ball to always keep his body between the ball and his opponent, combined with his confidence to execute body feints and subtle movements under immense pressure from his opponents to evade the press is truly incredible for his age. The stats back this us up as he averages 3.3 successful dribbles per 90 minutes, which is one of the highest for any central midfielder who has played more than 500 minutes in the top 5 leagues in Europe. As well as dribbling out of pressure, Ndombele can dribble into space with a great burst of pace, strength, and technique. Ndombele may look awkward when dribbling with his long strides, but he always maintains control of the ball using an array of different skills rather than using pure pace and strength to overpower his opponents. The reason Ndombele is such a unique commodity as a young midfielder in Europe is his combined ability to dribble and pass at an extremely high level. Ndombele is a very good passer due to the fact that he likes to take risks with his passes and has the ability to execute any type of pass. Ndombele is a very progressive passer as out of his average of 58 passes per 90 minutes, 79% of them will be forward passes. Even though Ndombele has operated as a defensive midfielder for most of the season, he has the vision and passing ability of a top-class attacking midfielder, as the timing of his through balls and long balls are usually perfect. Ndombele creates 0.3 assists per 90 which is the 8th highest for his position in Europe. When deployed as a defensive midfielder, Ndombele has to be competent in his defensive side of his game for this Lyon team to function, which he certainly is. As previously mentioned, the effective partnership of Lucas Tousart and Ndombele has meant that the Lyon defenders are largely protected by the pivot sat in front of them. Much of this has been down to Ndombele’s defending as a defensive midfielder. Ndombele’s positional understanding is very good as he reads the game so well, which enables him to be in great positions to make tackles and to intercept. However, he isn’t the type of midfielder like N’golo Kante to make endless interceptions and tackles, but what he does defensively is impressive. Furthermore, as a 1v1 defender, he is very skilled as he uses his aggression to dispossess the opposition. He makes around 4 tackles + interceptions per 90, which again is impressive for such a young midfielder. Due to his height, 5’11; Ndombele tends to lose a lot of his aerial duels. This could be a problem in the future, as opposition managers could target this weakness by playing floated or long balls into Ndombele’s zone, for a taller striker to win a header to flick onto runners. In addition to this, Ndombele as a goal threat is pretty minimal. He only averages 1 shot per 90 and has an xG90 (Expected Goals per 90 minutes) of 0.05, which are very low numbers for when seeing how much of a goal threat a player is. However, I’m more inclined to think that these numbers are a product of what his role in this Lyon side is, especially as he has played as a defensive midfielder this season. In reality, it is very hard to find a viable weakness in Ndombele’s game, which just shows how impressive the young midfielder is. Ndombele has improved significantly every season, from impressing in Ligue 2 for Amiens to dominating the majority of teams in Ligue 1. Ndombele is one of the brightest and most exciting young midfielders in Europe. It is hard to determine whether he is ready to move to a bigger club, but if he keeps putting in these impressive performances there is no limit to how far he can go in his career. Is Ronaldo about to make a sensational summer switch to the Premier League?